By Fiona Emdin. Reblogged from the CGIAR CCFAS blog. Different doctors treat different types of diseases. When the villagers of Rohal Suong in Cambodia feel sick, they can consult a doctor. Now when their crops are sick, they can also go to another doctor, a plant health advisor, who can provide information on the best methods to treat crop pests and diseases. Improved climate mitigation, adaptation and food security in the village are some of the goals of Rohal Suong as the first Climate-Smart Village (CSV) in Cambodia. It is one of the six CSVs under the CGIAR Research Program on Climate Change, Agriculture and Food Security in Southeast Asia (CCAFS SEA). Towards these goals, the villagers aim to implement integrated pest management, among other climate-smart agriculture (CSA) strategies. Integrated pest management, including activities under the Pest-Smart initiative, would address crop pests and diseases experienced by the village as affected by climate change. The General Directorate of Agriculture (GDA) of Cambodia and the Centre for Agriculture and Bioscience International South East Asia (CABI-SEA) organized atraining workshop for farmer representatives and project team members in Rohal Suong from 28 to 30 March 2016. The participants were trained in identifying major pests and diseases, recommending controls, giving advice on the safe use of chemicals and managing a plant clinic. 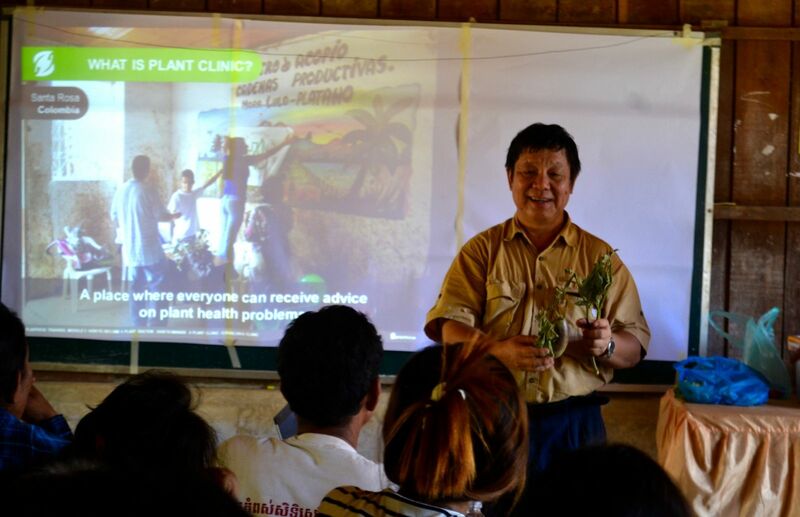 On 4 June 2016, the first plant clinic in Rohal Suong opened for consultation at the local primary school. Over 50 people, of whom 22 were farmers, visited the clinic to learn about common pests, diseases and other problems affecting local crops. Also present during the opening were teachers, school-aged children, officers from the District Office of Agriculture, commune and village authorities and representatives from WorldFish, the Centre for Agriculture and Bioscience International (CABI), Aphivat Strey (AS) and the Provincial Department of Agriculture (PDA). During the opening, WorldFish, PDA and CABI, the project leads for the clinic, introduced the plant clinic and gave detailed information on the common pests and disease affecting local rice crops. They also discussed how the plant clinic will operate in the future. After the presentation, farmers then presented samples of infected crops to the plant health advisors, who provided information on how to treat each pest and how to prevent pest outbreaks in the future. Farmers can bring plant samples to the plant clinic, which will be open every two weeks, when requesting for advice on addressing their crop problems. At any time, farmers can also text plant health advisors pictures of their crops to receive information on treating pests. If a plant advisor is unable to identify a pest or give recommendations on how to treat it based on the sample, it will be sent to the GDA laboratory for analysis. Farmers found the first plant health clinic as an effective step towards improving integrated pest management practices in Rohal Suong. For example, Madam Ang Mom, a farmer residing in the neighbouring village came to the clinic with a sample of her watermelon crop. Ms Siea Kimnay, a plant health advisor from PDA, found that the damage was caused by insect pests, such as thrips and mites. She recommended the use of a mixture of a bio-pesticide, including oil, neem, soap and onion, as treatment. “I am happy with the recommendation and I know the method for preparing the bio-pesticides… I will come to the clinic again to seek help because I hope to soon expand my watermelon acreage,” said Ang Mom. The plant clinic is therefore a powerful method for engaging community members and promoting gender participation, as seen in the opening session of the clinic. A number of local school-aged children and teachers also visited the clinic. It is hoped the clinic will be useful in promoting materials and practices that can bring positive impacts to the next generation. In addition, future plant clinics can continue to promote the use of improved pest management practices. They will be instrumental as well in preventing local pest outbreaks and ensuring that farmers buy effective, safe and certified pesticides.